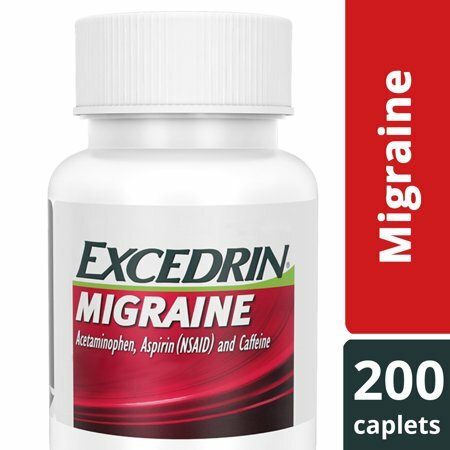 Excedrin Migraine relief medicine is the first nonprescription migraine pain reliever that combines acetaminophen and aspirin, along with caffeine to relieve migraine symptoms. Additionally, it's the number 1 Neurologist recommended OTC treatment for migraines (Among OTC medicine for migraines. IQVIA, 2018). Excedrin Migraine relieves pain, nausea and sensitivity to light and sound. Excedrin comes in a combination of strengths and forms, including Extra Strength and Migraine, which are available in geltabs and caplets, and Tension Headache and PM Headache, that are available in caplets. Plus, every Excedrin pain relief product goes to work fast, so you can get back to your day without the worry of a headache. Try Excedrin headache medicine today. Warnings: Reye's syndrome warning: Children and teenagers who have or are recovering from chicken pox or flu-like symptoms should not use this product. When using this product, if changes in behavior with nausea and vomiting occur, consult a doctor because these symptoms could be an early sign of Reye's syndrome, a rare but serious illness. Allergy alert: Acetaminophen may cause severe skin reaction. Symptoms may include: skin reddening; blisters; rash. If a skin reaction occurs, stop use and seek medical help right away. Aspirin may cause a severe allergic reaction which may include: hives; facial swelling; asthma (wheezing); shock. Liver warning: This product contains acetaminophen. Severe liver damage may occur if you take more than 2 caplets in 24 hours, which is the maximum daily amount; with other drugs containing acetaminophen; 3 or more alcoholic drinks every day while using this product. Stomach bleeding: This product contains an NSAID, which may cause severe stomach bleeding. The chance is higher if you are age 60 or older; have had stomach ulcers or bleeding problems; take a blood thinning (anticoagulant) or steroid drug; take other drugs containing prescription or nonprescription NSAIDs (aspirin, ibuprofen, naproxen, or others); have 3 or more alcoholic drinks every day while using this product; take more or for a longer time than directed. Do not use: if you have ever had an allergic reaction to acetaminophen, aspirin or any other pain reliever/fever reducer; with any other drug containing acetaminophen (prescription or nonprescription). If you are not sure whether a drug contains acetaminophen, ask a doctor or pharmacist. Ask a doctor before use if you have never had migraines diagnosed by a health professional; you have a headache that is different from your usual migraines; you have the worst headache of your life; you have fever and stiff neck; you have headaches beginning after or caused by head injury, exertion, coughing or bending; you experienced your first headache after the age of 50; you have daily headaches; you have a migraine so severe as to require bed rest; you have liver disease; stomach bleeding warning applies to you; you have a history of stomach problems, such as heartburn; you have high blood pressure, heart disease, liver cirrhosis, or kidney disease; you are taking a diuretic; you have asthma; you have problems or serious side effects from taking pain relievers or fever reducers; you have vomiting with your migraine headache. Ask a doctor or pharmacist before use if you are taking a prescription drug for: diabetes, gout, arthritis; under a doctor's care for any serious condition; taking any other drug; taking any other product that contains aspirin, acetaminophen; or any other pain reliever/fever reducer. Stop use and ask a doctor if: an allergic reaction occurs (Seek medical help right away); you experience any of the following signs of stomach bleeding: feel faint, vomit blood, have bloody or black stools, have stomach pain that does not get better; your migraine is not relieved or worsens after first dose; new or unexpected symptoms occur; ringing in the ears or loss of hearing occurs. Pregnancy/breast-feeding warning: If pregnant or breast-feeding, ask a health professional before use. It is especially important not to use aspirin during the last 3 months of pregnancy unless definitely directed to do so by a doctor because it may cause problems in the unborn child or complications during delivery. Keep out of reach of children. In case of overdose, get medical help or contact a Poison Control Center right away. Quick medical attention is critical for adults as well as for children even if you do not notice any signs or symptoms. Other warnings: Caffeine Warning: The recommended dose of this product contains about as much caffeine as a cup of coffee. Limit the use of caffeine-containing medications, foods or beverages while taking this product because too much caffeine may cause nervousness, irritability, sleeplessness, and, occasionally rapid heart beat. Tamper Evident Bottle: Do not use if inner foil seal imprinted with sealed for your protection is broken or missing. Inactive Ingredients: Benzoic Acid, Carnauba Wax, FD&C Blue #1, Hydroxypropylcellulose, Hypromellose, Light Mineral Oil, Microcrystalline Cellulose, Polysorbate 20, Povidone, Propylene Glycol, Simethicone Emulsion, Sorbitan Monolaurate, Stearic Acid, Titanium Dioxide. Ingredients: Active Ingredients: In Each Caplet: Acetaminophen (250 mg), Aspirin (250 mg) (NSAID), Caffeine (65 mg). Purposes: Pain Reliever, Pain Reliever; Nonsteroidal Anti-Inflammatory Drug, Pain Reliever Aid. Inactive Ingredients: Benzoic Acid, Carnauba Wax, FD&C Blue 1, Hydroxypropylcellulose, Hypromellose, Light Mineral Oil, Microcrystalline Cellulose, Polysorbate 20, Povidone, Propylene Glycol, Simethicone Emulsion, Sorbitan Monolaurate, Stearic Acid, Titanium Dioxide. Instructions: Directions: Do not use more than directed. Adults: Take 2 caplets with a glass of water. If symptoms persist or worsen, ask your doctor. Do not take more than 2 caplets in 24 hours, unless directed by a doctor Under 18 Years of Age: Ask a doctor. Benzoic Acid, Carnauba Wax, FD&C Blue #1, Hydroxypropylcellulose, Hypromellose, Light Mineral Oil, Microcrystalline Cellulose, Polysorbate 20, Povidone, Propylene Glycol, Simethicone Emulsion, Sorbitan Monolaurate, Stearic Acid, Titanium Dioxide. No other OTC medication works like this! Super reliable relief! I keep a small 24ct bottle in my purse at all times, a bottle at my desk and work, and a bottle at home. I always have it with me and it has never let me down!!! Excedrin Migraine is the onlyyyyy medicine I trust! I take this, turn the lights off and relax to only feel better about 20-30 minutes later. I rave about it to every one I know! The Excedrin migraine gel tabs are gream remedie to stop a headache. 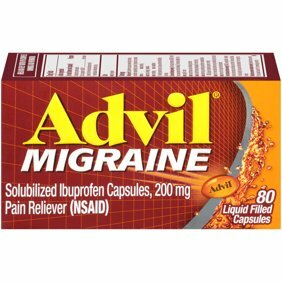 I suffer from migraine and this product is the only one that helps me and gives me relief. For me it takes like abour an hour to take effect and begin minimizing my headache. Really fast compared with other brands and i personally tested and eork great . It was when I realized I was having excruciating headaches that I couldn't find relief for, that I realized I was a victim of migraines. Just yesterday I was suffering form a migraine for over 4 hours because I was at work with no relief but within 40 minutes of taking Excedrin Migraine I felt the headache start to evaporate. By an hour and 15 minutes after, it was completely gone. It was not the first time I had taken Excedrin but I was still in shock at the amount of relief I got so quickly. If I feel a migraine coming on, I don't think twice about taking this! I cant use anything else other then Excedrin Migraine. Maybe Excedrin Extra Strength but otherwise nothing. Its just amazing.